Do you have a horse crazy kiddo that would love some time on the farm and would like to get more comfortable with horses? Right now many of our horses are being used for lessons but we have a couple that could use some light exercise with small riders so we are offering a lead-line lease. This is a a great deal and an awesome opportunity; you won't find anything like this in town. 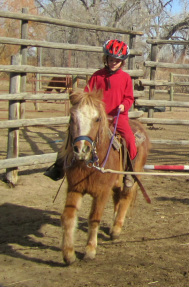 *Parents must have some horse experience as you will need to saddle the horse or pony on your own. *The lease includes an initial lesson and introduction to horse and farm safety. *Great opportunity for parent - child time as you spend quality horse time together grooming, tacking up, and leading your child. Her name says it all. :) Sassy is a super sweet pony that has been used for parties and parades. She's unflappable. We use her for our lessons and pony rides. Great for lead line.